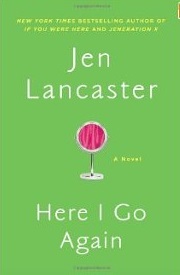 This week I'm starting Here I Go Again by Jen Lancaster. I don't think I've read anything by her before. I scan the woman's outfit up and down. A thong-bottom leotard worn over neon tights? With high-top Reeboks? Seriously? I'm sorry, were you possessed by the ghost of 1983? I feel a twist in my stomach, maybe from nerves. Of course, that could just be Mamma's gumbo. That woman does not skimp on the andouille. I'm not sure. What do you think? Dreaming of France -- Tea or Coffee? aybe we can all satisfy our yearnings for France, until we get there again. Everything about food is such a production in France, and I love that. The little teapot that comes to steep the tea and the paper wrapped sugar cubes. Wish I was sitting at this cafe with my husband right now.What are you dreaming of? If Marian Keyes wasn't one of my favorite authors, I wouldn't have picked up this book. The title is too clunky -- The Mystery of Mercy Close. First, I don't usually read mysteries, and, second, Mercy Close sounds like some of those poetry squares put together on the refrigerator without any meaning. 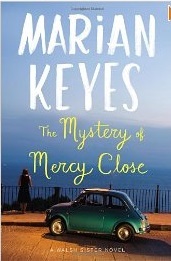 But I do love Marian Keyes so I got the book and finished it a day later. A lot of times, Marian Keyes' books are considered Chick Lit. That got me thinking about the genre. Keyes' characters are funny and quirky, but they are dealing with serious situations and trying to figure out who they are. If a man wrote a similar book, he would be wise and insightful. So, I'm not going to call Keyes' book Chick Lit. This book was about one of the Walsh sisters -- there are 5, and Keyes has written various books about the Irish sisters with each of them starring in one. You don't need to read the others though, this one stands alone. The book begins with Helen Walsh, a private investigator, moving back home after she loses her apartment during the recession. Helen is in her early 30s, and she has a hunky boyfriend who is a father to three children. They have only been dating six months so she can't move in with him and his kids. "I couldn't afford to pay the mortgage. You're making it sound like it's my fault. Anyway, it's more complicated than that." "You have a boyfriend," Mum said hopefully. "Can't you live with him?" "You've changed your tune, you rampant Catholic." "We have to keep up with the times." Early in the book, we begin to see hints that more than finances have turned south for Helen. Wait a minute! Vultures?In a city? I took a second look and they weren't vultures. Just seagulls. Ordinary Irish seagulls. Then I thought, Ah no, not again. We soon learn that Helen had suffered from depression three years earlier and her financial troubles send her back into depression. But this isn't simply an introspective book about depression. Helen is hired by an ex-boyfriend to help find a former boy band star who has disappeared just before the boy band reunion. Millions of dollars are at stake. The work is the only thing that helps Helen hold on. I think Keyes, who has also suffered with depression, did a great job of relating the hopeless feelings that accompany depression, and conveying that depression isn't necessarily cause and effect -- it sometimes happens for no reason. It's a brain issue. I did figure out where the boy band member was awhile before Helen did, but that didn't ruin my fun. Other than the title, I thought the reason Helen hated her ex-boyfriend was a little weak. The rest of the book ran away with me. Keyes is a wonderful writer and her characters are people I would love to run into in a bar to just while away the evening as they spin their Irish yarns. On Thursday, I walked home from work because all the cars in the family were busy. 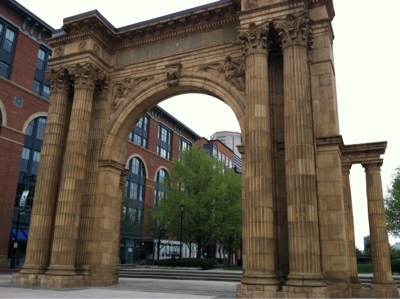 It gave me a chance to take a picture of the Union Station arch in the Arena District of Columbus, right across the street from the arena where the Blue Jackets hockey team plays. I never got to see the actual building. This was all that was left when I moved to Columbus. Number 19 -- Something to Brag About? One of my new obsessions is checking my sales numbers on Amazon. 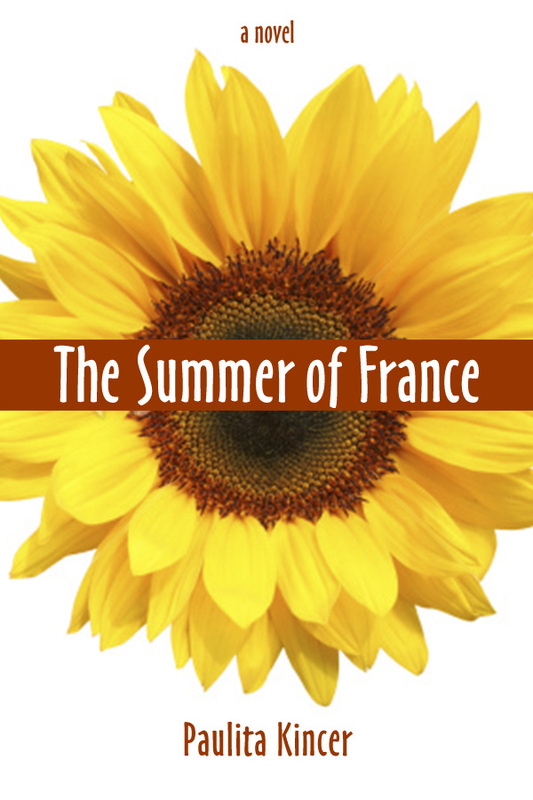 I've sent some press releases to the local newspapers and I'm preparing for a tour on Francebooktours.com, which is, of course, about books set in France. So in February I set a goal to sell at least one book per day and I surpassed that goal. In March, I was shooting for two books per day and surpassed that. My ritual for checking my sales numbers is to first look at the Amazon.com numbers to see where I rank. Next, I look at Amazon.co.uk numbers to see where I rank there. My numbers are almost always better in the UK than in the US. It might be my British sense of humor! I've risen to as high as #8 in Kindle books under France. So, I'll keep plodding along, hoping that each book I sell will lead to another one, or another two. Thanks for all your support as I continue to muddle through this writing/publishing thing. 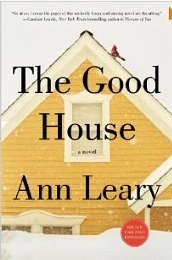 This week, I started The Good House by Ann Leary. I think I must have seen this on someone else's teaser and that's why it ended up on my shelf. I can walk through a house once and know more about its occupants than a psychiatrist could after a year of sessions. I remember joking about this one evening with Peter Newbold, the shrink who rents the office upstairs from mine. I like this intro and I'm hoping the rest of the book lives up to it. In fact, I'd love to compare my original observations regarding Rebecca McAllister with Peter. She was depressed, for one. I drove past the McAllister's one morning in late May, not long after they'd moved in, and there she was, out in the early morning haze, planting annuals all along the garden path. It wasn't even 7 a.m., but it was clear that she'd been at it for hours. 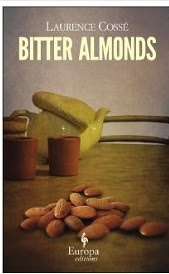 I read Bitter Almonds by Laurence Cossé a French author. The novel is set in Paris. The main character, Edith, is a middle class French mother. She agrees to hire the building supervisor's mother to do her ironing three hours each week. The woman in her 60s, Fadila, is from Morocco. 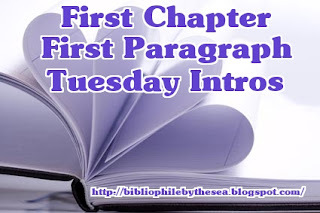 From the beginning, Edith is annoyed with Fadila because she doesn't keep regular hours. Soon, Edith learns that Fadila never learned to read or write, either in Arabic or French. Before long, she is bringing letters, often still sealed. Bills, summons, advertisements, she can't tell them apart, any form of mail frightens her. She has to get someone else to read it to her. "I'm stupid," she says. She doesn't know how to sign her name: she just scribbles a little zigzag. I don't know much about translating, but I'm assuming the person who translated this novel followed the writing style of the French author. It is simple and direct. Nothing superfluous was added to this book. Edith soon gets to know Fadila much better as she attempts to teach her how to read and write. 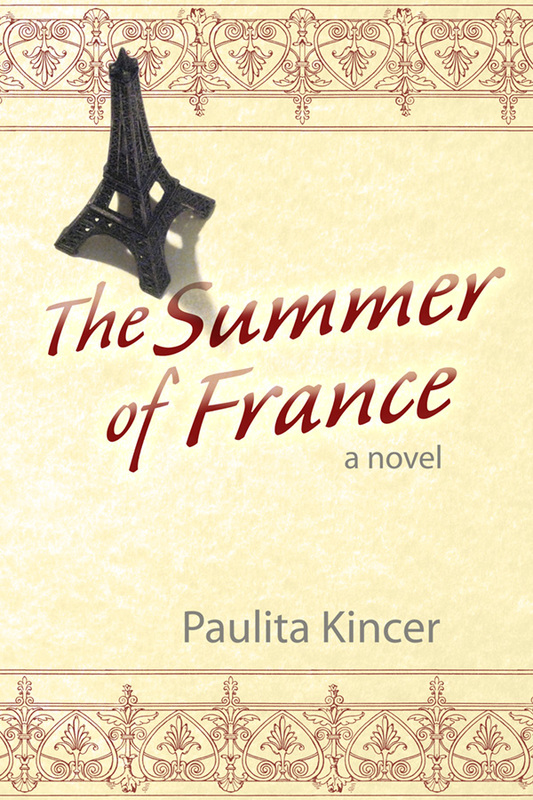 As they work on the letters and words, Edith becomes aware of the very different life that Fadila lives right there in Paris. Her apartment in a tiny, airless room where she lies awake at night feeling claustrophobic. Her adult children take the money she earns ironing and rarely spend time with her. Edith and her reading lessons help fill the gap. I can't really explain why I enjoyed this book. There were no flashy French meals described or rich descriptions of Paris. Instead, it was the everyday French culture that I enjoyed visiting, and like Edith, I learned about the immigrant culture there as well. The book caught my attention and I finished it pretty quickly. I'd recommend this book. 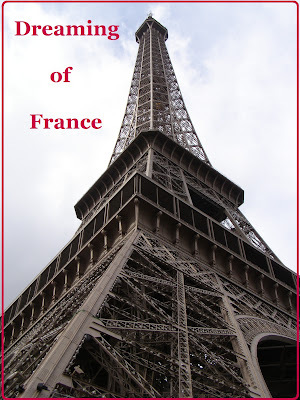 This book also counts for my book challenge, Books on France by Emma at Words and Peace. I couldn't decide which photo to post today. I have a bunch of this scene, looking out over the lake from Mom and Dad's house in Florida. I love the sun shining beneath the clouds. Hope you are having a sunny weekend. I suppose it is too much to ask teenagers to be grateful for what they have. I was reminded of this yesterday when Tucker was complaining about the black car. He drives the black car, a 1999 Ford Taurus, to school and back most days. Earl and I, along with Grace, juggle the other car, which mostly works because I work days and Earl works evenings. Tucker, 17, sees it as a necessity to have a car even though most places he ventures to, like school, are about a mile away. I understand that driving has to do with status rather than need. Yesterday though, as he started to ask when we were going to replace the black car, complaining about the squeak when he turns the wheels, or the sun roof that doesn't work, and the way it vibrates on the highway (which he rarely goes on), I started to get fed up. "You know, you just came back from France and New York, so money is a little tight," I told him. 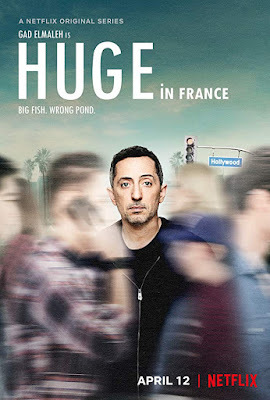 It's true that he helped pay for the France trip, and the trip to New York was required as part of his Singers class, but the family still made financial sacrifices. And this at a time that my second job has dried up due to low enrollment at one of the colleges where I teach. My feeling was, if he didn't want to drive the black car, then he could walk. I was complaining to my mom later about how ungrateful Tucker was when I remembered a story about myself at his age. My parents bought each kid a used car for their 17th birthday. They started the trend with my sister, so continued with each of us. 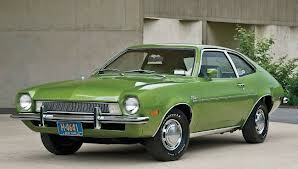 My car was a dark green pinto. I worked at Kings Island amusement park during my high school summers so I had to take the freeway to get there. As I pulled onto the freeway, getting up speed, the Pinto stalled. I was able to coast to the side and sat in the car wondering what I would do. This was long before the days of cell phones. I was just bracing myself for a walk down the highway and exit ramp, when a car stopped in front of me. He drove me home and my dad took care of the Pinto. He had work done and swore that the car was road ready. I refused to drive it again. "I will not drive that Pinto," I stated indignantly. I was an insufferable teen and my parents, who had lost my sister around the same age, indulged me. 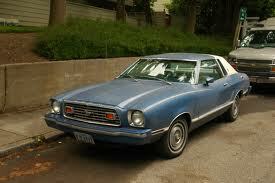 My dad found a blue Mustang II that I drove through the rest of my high school and college years. So as I complained about Tucker, I recalled that insufferable teenager that I was. I hope I've changed a lot since then and I'm sure Tucker will too. But he still has to drive the black car. There's a ring at the door. Édith is at work on the dining room table. I won't get it, she thinks, the hell with it. Who could it be? It's almost dark. But she gets up, goes to open. The opening wouldn't grab me at all, but the simple, straightforward writing (translation) just moves along and I went with it. The story is about a middle class French woman who decides to help her Moroccan house maid to read. As the story unfolds, they learn about each other's lives. She cannot tell the i apart from the other letters. Clearly there is nothing distinctive about a dot above a letter. As for "above," it's as if Fadila hadn't a clue what she meant by it. Like I said, I enjoyed this novel. Here's another photo from Tucker's school trip to France. I love the richness of it. I'm really hankering for France this week so can't wait to see what you all are posting. Today, my youngest son Tucker returned from a trip to New York. He went with the Singers from our town, which is the small high school choir that requires a tryout. They left Wednesday night and have been gallivanting around the Big Apple since then. The trip included two concerts they gave in cathedrals, a concert by the New York Pops in Carnegie Hall, and a ticket to The Phantom of the Opera. I know, I must be living in the wrong time period, cause I didn't get to do things like that when I was in high school. The downside though was the warning email from the director who said one of the chaperones found a bedbug as she was packing to come home. 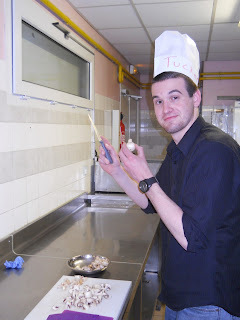 Here's Tucker during a cooking class in France. That meant all the parents meeting the bus today had plastic garbage bags. We wrapped up the suitcases before bringing them home. Earl stood outside on the (luckily) nice day separating the clothes then transporting them to the hot water in the washer and an extra-long dry in the dryer to kill any bedbugs or eggs. The things that can't be washed, leather shoes, ties, suit jacket, went into the freezer. Hopefully, we'll elude the bedbug issue. This afternoon, I made a Swiss cheese and sausage quiche. Dinners are tricky things at our house since Earl works in the evenings and Grace is at work then rehearsal til 4:30. I try to prepare a meal somewhere in the middle. I was listening to Rick Steves on my computer, picking out all the stories about France, so I finished off that bottle of red wine that Tucker brought us from France. It all put me in the perfect mood to take my computer, and the red wine, out to the front porch for some writing. I've written more than 30,000 words of my sequel to The Summer of France. This one has the working title of Autumn in Aix, and Grace says I'm not allowed to send an email to the Louvre asking them how they box up and move exhibits from the Louvre. She says that will get me on some sort of black list so I'll never be able to visit again. And I'll add some music from Pandora, but first, I visited youtube for some Midnight in Paris music. This one seems appropriate. "Dream a Little Dream of Me." I'm dreaming big today, and it's not even Dreaming of France meme until tomorrow. Hope your Sunday was equally dream filled. Last week, the trees were all bare. 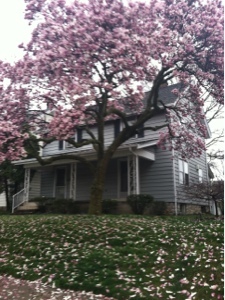 Some flowers had popped through, but the weather wasn't nearly warm enough to call forth spring. But this week, we had some glorious warm weather and the foliage responded. 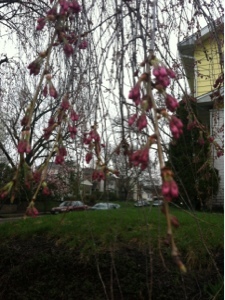 I think this is a weeping cherry tree with its pretty pink buds. 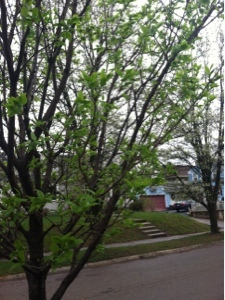 I love how bright green the leaves are when they first emerge. If I made crayons, I would call this color tender green. I should know what kind of tree this is, but I don't, so I'll just enjoy the cascade of flowers all over it. Hope the weather and the plant life are beautiful wherever you are this week. Sending Tucker off to France last week, we all had high hopes for gifts that he would bring back. He brought me some yummy dark chocolate. Grace got a soft, orange scarf. "I know this seems lame," he said as he handed Earl the smooth, brown stone, but it came from Omaha Beach. He showed us a picture he had taken on the beach with the rock in his hand. Tucker knows that his dad is a history buff and has always wanted to visit the Normandy beaches where the Allies launched an offensive against German-occupied France in World War II. Omaha Beach is one of those beaches. He also took pictures of the inside of the pillboxes, defensive structures the Germans had built to fight against the invasion. The roofs of the pillboxes were scorched from the fighting. In an attempt to redeem himself for the rock, Tucker also gave us a bottle of wine. He had pictures from the cave that they toured and where he purchased a 10 Euro bottle of wine. He didn't say if he tasted several in an attempt to find the right wine. We were a little surprised that he was allowed to bring it in to the U.S. since he's under 21, but we didn't question it. 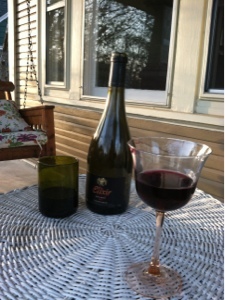 We enjoyed some wine on the front porch last night and it was delicious. My youngest son returned home from France Sunday evening, exhausted as he showed me his array of photos. "Which should I use for my blog?" I asked him. He chose the one below, which he considered the best picture he took on his trip. I'm excited to show you some of the others too though, including some panoramic views he took. Maybe next week. 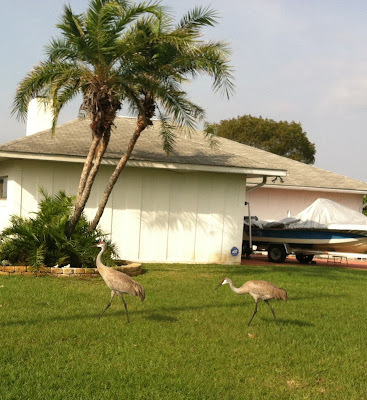 When we stayed at my parents' house in Florida, we heard the Sandhill Cranes calling a lot, but didn't get to see them that often. Here's a shot of them fairly close. They're pretty big birds. Probably up to my shoulder when they're standing upright. They're protected in Florida, but I've read that they are hunted in other states. Hearing them warble in the morning as the sun was rising made me feel like I was in Africa. My kids have forced me to enter the 21st century with social media. I check my Facebook most days and post on there at least once a week now. And last week I set up an Instagram account. Joining each community can be laid at the feet of my children's travel and independence. I joined Facebook in August 2010 as Grace journeyed 10 hours away to college. I wanted to be able to keep up with her posts and her friends. I still wanted to keep an eye on her. Luckily, she didn't mind adding me as her friend. Slowly I've added friends and when I got my iPhone, I found it easy to check Facebook, like other people's posts, and add my own "status updates." My middle child doesn't have a Facebook page, and my youngest wouldn't add me as a friend, but he isn't active on Facebook any more. Now he's all over Instagram. As he prepared to leave for a trip to France, I realized that if I wanted to see his pictures, I'd need to follow him on Instagram. To me, the worst part about setting up an account for Instagram or Twitter or even Words With Friends, is choosing a user name. I know I'm going to be stuck with this name forever. Should I choose my name? Something I like -- writing, running, mochas? I avoided all "mom" names. Tucker begrudgingly added me as a friend on Instagram and has posted sparsely this week from his trip abroad. 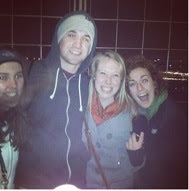 Heer's on that he tagged: "Average night on the Eiffel Tower." And I note how "miserable" he looks surrounded by high school girls. I have a couple of people following me on Instagram, but I haven't posted anything and don't know when I will. For now though, I'm on Instagram and Facebook getting hints into the secret lives of my teenagers. 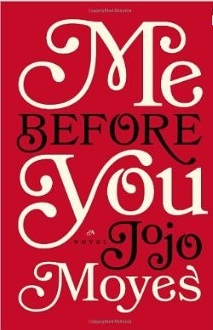 This week I'm starting Me Before You by JoJo Moyes. I got this book because there's a lot of buzz about it. People seem to love it. Hope I do too. When he emerges from the bathroom, she is awake, propped up against the pillows and flicking through the travel brochures that were beside his bed. She is wearing one of his T-shirts, and her long hair is tousled in a way that prompts reflexive thoughts of the previous night. He stands there, enjoying the brief flashback, rubbing the water from his hair with a towel. "It's not old people. It's a...a private position. To help in someone's house, and the address is less than two miles from your home. 'Care and companionship for a disabled man.' Can you drive?"